The San Francisco Giants are tired. They aren’t just physically tired; they’re also mentally tired. After playing a total of 178 games last season, the Giants had a shortened offseason and less time to recover, both mentally and physically, before this season. The Giants currently have a 38-40 record, third in the NL West, and they have lost four games in a row. In their last two games, the Giants have been outscored 7-0 in the 6th inning. Is this onslaught just bad luck? A coincidence? Actually, this stat explains a lot about the Giants’ recent struggles. 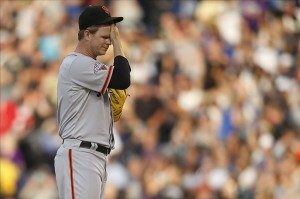 The sixth inning, in particular, has brought trouble to the Giants recently for several reasons. First of all, their pitching has taken a downturn starting around the sixth inning. The Giants’ pitching, in general, has been up and down all season. At the beginning of the season, the starting pitching was horrendous. Matt Cain and Ryan Vogelsong, usually steady forces in the rotation, were horrible and didn’t show consistent command of their pitches. Because of this, the bullpen had to step up and pitch more than usual. Recently, the starting pitching has picked up. In the month of June, Tim Lincecum has looked better and has posted a 3.60 ERA. Cain has improved steadily since his horrendous month of April when he had a 6.49 ERA. In the month of May, Cain had a 3.48 ERA and in June, Cain has a 3.58 ERA. Even though the starting pitching has picked up, the Giants have not yet thrown a complete game, which explains why the bullpen has looked tired. The bullpen’s effectiveness has started to decline because of overuse in the beginning of the season. Several pitchers, such as George Kontos, have struggled with command, perhaps because of exhaustion. The second reason why the sixth inning has been problematic is that the starting pitchers aren’t consistently making the right adjustments. As the sixth inning approaches, pitchers are generally set to face the opposing lineup the third time around. Often, it seems like the Giants’ starting pitcher will either pitch to the opposing batter the same way they have been all game, which ends up backfiring, or, if adjustments are made, the opposing batter anticipates it and knows how to beat that move. By this time, the opposing batters have made their own adjustments as to how to approach their next at-bat, given what the pitcher has done in their previous at-bats. Therefore, the batter knows exactly how the pitcher is going to pitch to him, which can lead to base hits and runs. The third reason these runs in the sixth inning could be occurring is simple exhaustion from high pitch counts. The Giants’ starters rank first in the NL for most pitches per plate appearance with 3.9 pitches. Many Giants’ starters drive the pitch count up high in each at-bat, which forces them to become more tired, earlier in the game. When pitchers become tired over the course of a game, they start to lose command of their pitches, and this has started happening to the Giants starters around the dreadful sixth inning. Because of these reasons, Bruce Bochy has two options when managing a tough situation like this. He can leave the starter in the game longer, but that can backfire because it’s hard for a pitcher to re-gain command once he’s already lost it. 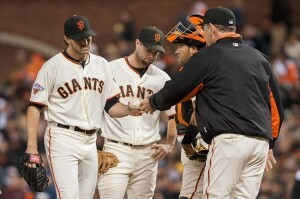 It does seem like Bochy trusts his starters too much sometimes. He can get into the habit of leaving a pitcher in one batter too many, and it can end up costing the Giants a run or two. The other option Bochy has is to pull the starter at the first sign of exhaustion and go to the bullpen. However, since the bullpen has been used so much this season, he has been hesitant to do that, which forces him to leave his starter in longer. This whole process becomes a vicious cycle, and the Giants are stuck in one right now. In addition to the struggles the Giants have had with their pitching, they have also seemed lost at the plate recently. The Giants have several players on their roster who are known as “free swingers.” These players don’t generally take too many pitches, and, they have been swinging at pitches early in the pitch count. In addition, many of these pitches are out of the strike zone or just generally unhittable. The Giants aren’t showing enough patience at the plate, so they miss the opportunity of being rewarded with mistake pitches or pitches that are more hittable. It just seems as if the long 2012 season is starting to catch up with them in terms of mental mistakes, fatigue, and injuries. The Giants are in quite a difficult situation. They’re stuck in a vicious cycle where Bochy can’t trust his relief pitchers, and the starters are slowly falling apart. The mental and physical exhaustion has started to spread into the offense as well. The All-Star break couldn’t come soon enough for the Giants. They could use a break from the long road trips and the mental grind of the game. The Giants will recover though; it’s just a matter of time. ← Should the Warriors Try to Acquire Carlos Delfino?